It is amazing that those are drawings of the same vent, damaged in the same battle! My initial vote would go to drawing no.2 (JACAR, Ref. 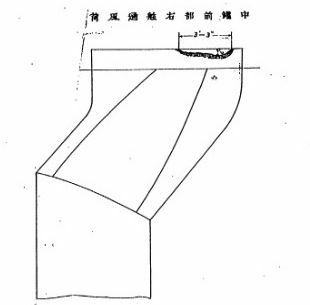 C05110130600) since it's a technical drawing and records damage in some detail. Second one is more of a sketch than a drawing, records much less damage and could have been done from memory without looking at the actual vent. Thank you Mr. DariusP. I think that your opinions are reasonable. But, in several cases, such drawings contain errors. 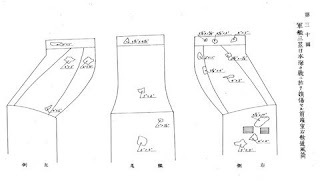 For example, one sketch of vent of fore boiler room seems to be diverted to sketch of vent of middle boiler room, although actually they have different shapes. 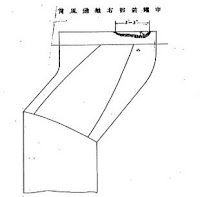 sketch of vent of fore boiler room. this shape is almost correct. 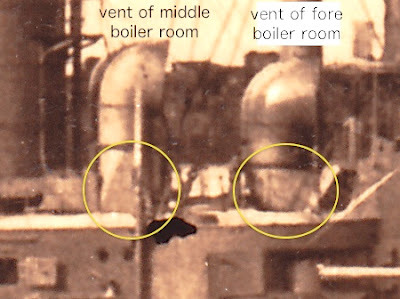 sketch of vent of middle boiler room. this shape is similar to above, but incorrect. From photo of Museum Mikasa in around 1926. The vent of fore boiler room is bended, but the vent of middle boiler room is straight. Note: This image is flipped horizontal for comparison with the sketches. So, there is a possibility that the drawing no.2 is made from a copy of drawing of aft vent of the engine room, which might differ from fore one. 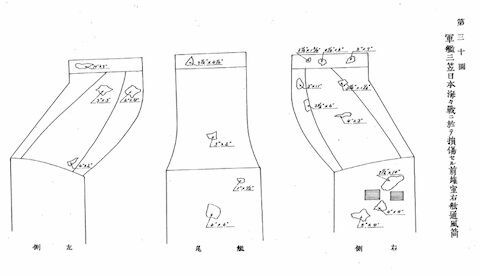 On an accurate plan view of Mikasa one should be able to measure this sideways shift of the vent's cowl and resolve the question. Yes, I will continue search the plan. I'm sorry, but my response may be late. My 4-days-straight holidays are over.